Hot rain falls down upon a cold, rotting city. Here the Yugai, a species of militant humanoids, leave the survivors of the worlds they have ransacked and destroyed. It is a prison and a work camp, a place for those who lived through Yugai invasion to live out their remaining years as slaves. This is Gatorum, the City of Remnants. In City of Remnants, players take on the roles of gang leaders, each one with their own unique qualities and motivations. Players will struggle to control the city, but only the winner can decided the city's future. Wage open war on the streets of Gatorum. Develop your territory with various criminal establishments. Buy illegal weapons and tech on the black market. Hire the finest killers, thieves, and scammers money can buy. Avoid gaining the attention of Yugai security forces. 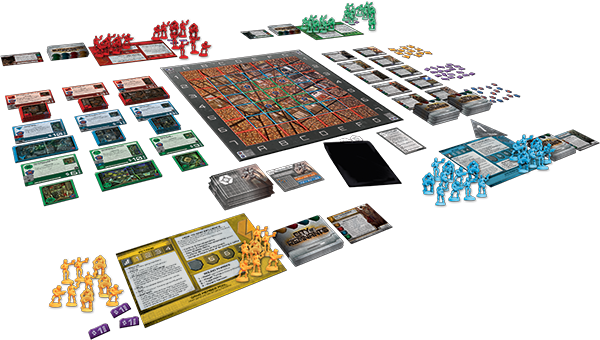 In City of Remnants, two to four players vie for power in a dystopian world. Many paths to victory lay before you. Bid for gang members who provide a variety of shady skills. Get an edge with weapons and other sundrys from the black market. Build districts that can provide you with advantages, production and income, but beware, because a greedy opponent might sweep in and take over the work of your own hands. 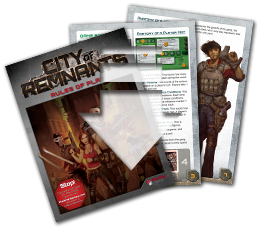 City of Remnants combines strong resource management, auction, and conversion mechanics with spatial tactics, assymetric player powers, area control and direct conflict. A variety of tools, different every game, are at your disposal to build up your gang and claim the city for yourself. But watch out for the Yugai police force, who will meddle with everyone's plans! Create your own path to victory with this outstanding debut game from designer Isaac Vega. Click here to pre-order this item. Lost your rulebook, or just want to check out the rules to the game? Download the rules by clicking here. "Search your draw pile or discard pile for a card of your choice. Place the chosen card into your hand. If you searched your draw pile, shuffle it." Click here to download the game rules.